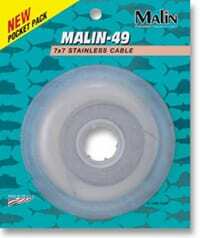 Malin’s Malin-7 is 1 x 7 stainless steel cable. Malin-7 is comprised of 7 individual strands that are performed and stranded. It has good flexibility, excellent strength and abrasion resistance. Malin-7 makes excellent leaders for both trolling and bottom fishing. It comes in 15 lb. test through 250 lb. test. 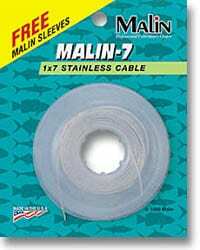 Malin-7 is available packaged on our handy pocket pack, which includes 30 feet of cable and 12 free sleeves. It is also packaged on spools of 300, 400, 600, 1,000, 2,000, 5,000 and 10,000 feet. It is available in the dark coffee color or bright finishes. Malin’s high quality soft stainless steel, soft monel and copper wire are available in our patent pending dispenser can and our handy pocket pack dispenser. The dispenser can contain 800 feet of wire, while the pocket pack dispenser holds 200 feet of wire. Our Rigging Wire is a great value and is ideal for rigging Malin Soft Wire baits since it is not pre-cut. You use what you need. The soft stainless is actually the same wire we supply to the aerospace industry as safety lockwire and can be used in a variety of applications. The soft monel is the ultimate bait rigging wire – it can be used over and over because it is so supple it does not break. The copper is the economical choice for bait rigging. You simply can not find an easier way to dispense rigging or safety wire. They are available in 15, 20 and 30 lb. test. 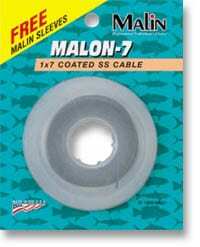 Malin’s Malon-7 is the same high quality 1 x 7 cable as our Malin-7, only we nylon coat it in clear, black or coffee. The nylon coating makes a smooth finish that is excellent for making all kinds of rigs and leaders. It is available on our handy pocket pack which includes 30 feet of cable and 12 free Malin sleeves. It is also packaged on spools of 200, 300, 600, 1,000, 2,000, 5,000 and 10,000 feet. Malin’s Malin-49 is made of high-quality stainless steel. It is constructed using 49 individual strands, 7 x 7. Trident 49 is extremely strong and flexible. These properties make it excellent for use as leaders, trolling line, deep dropping, hook rigs and all sorts of marine rigging applications. Malin-49 is available from 80 lb. test to 920 lb. test. It is available packaged in our handy pocket pack, which includes 30 feet of cable. It is also packaged on spools of 150, 250, 1,000, 2,000, 5,000 and 10,000 feet. Finishes include both the dark coffee color and bright.